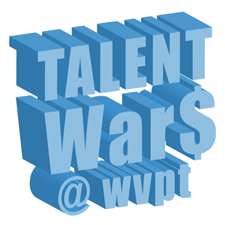 WVPT has entered its last month of fundraising through TALENT WAR$ with more than $1,800 donated through more than 40 competing talent videos. The station’s first ever interactive, online, video talent contest and fundraiser, TALENT WAR$ is offering $6,000 in cash prizes. Viewers can vote for their favorite video by donating to WVPT until Jan. 3., after which the winners will be announced. “TALENT WAR$ is one creative way that WVPT is responding to try and make up for hundreds of thousands of dollars in state funding cuts this year,” said David Mullins, president and general manager of WVPT. Mullins said the competition, which harnesses the power of social media, is a way to spotlight the talents of WVPT viewers and provide a fun way for people to support the station. Viewers can simply visit the secure website, http://talentwars.wvpt.net, to view the videos, select their favorite and “vote” by making a donation to WVPT. Every dollar “donated” equals one “vote” for the video. The three participants with the most $1 “votes” by the conclusion of the contest will win a first place award of $3,000, a second place award of $2,000 and a third place award of $1,000. Currently, more than 30 contestants have uploaded their talent videos, from live performances and music videos to animated shorts. Most of the top contenders are from the Harrisonburg area, but votes are coming from all throughout Virginia and even across the country. JanieFrazier, Port Republic: Janie Frazier, a senior at Eastern Mennonite High School, has held the most votes the entire competition. Her video, “Back to School!”, a stopmotion animated short featuring a backpack and school supplies come to life, took more than 24 hours to complete. Although her video has raised nearly $300, Janie said she didn’t ask friends and family to support her video until recently. “It’s really encouraging that people I don’t even know like my video so much that they’ve contributed their own money,” she said. To enter TALENT WAR$ orview current entries, visit http://talentwars.wvpt.net.